My brain wasn't really connected when I made this card - (note to self: wait until after breakfast in future!) but I think I got away with it even though it wasn't what I had in the half of my mind that was awake! This is the beautiful new Humming Along bundle. What I had in mind was a stained glass effect on a piece of vellum, artfully arranged on a card front. So I started out by gold heat embossing the images and colouring on the back with Stampin' Blends alcohol markers. It was at this point that my brain went into hibernation! Instead of loosely and artfully arranging my piece of vellum, I put a piece of Multipurpose Adhesive paper on the back of the vellum and stuck it to a piece of Whisper White card. I looked at it and thought - well, that was stupid, I might just as well have worked straight onto the piece of white cardstock! The base card is Bermuda Bay with a layer of Calypso Coral - a colour combo that I love. 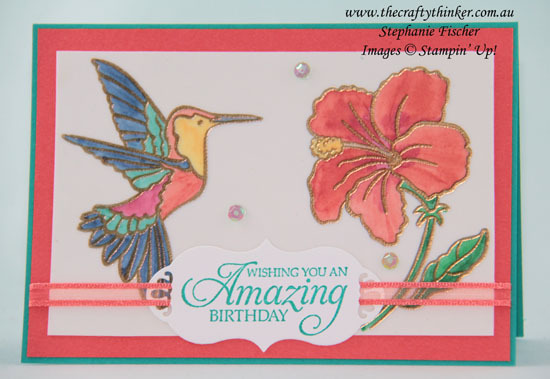 The greeting is stamped with Bermuda Bay ink and I used one of the dies in the coordinating Hummingbird Framelits set (buy the bundle to save 10%) to cut it out. The cute little cut outs at each end of the label, to me, looked custom made for ribbon so I slipped it onto a piece of Grapefruit Grove Organdy Ribbon - one of the 5 colours in the combo pack that I got FREE from the Sale-A-Bration brochure. If you'd like to know more about how to get FREE products during Sale-A-Bration (it ends on 31 March), click here. If you'd like some catalogues (live in Australia and don't currently have a Stampin' Up Demonstrator), contact me.